The Union County Prosecutor’s Office, Union County Police Department, and local elected officials and health professionals are urging residents to take a moment this October to dispose of their unwanted prescription medication at one of two county locations participating in the New Jersey Office of the Attorney General Division of Community Affairs’ Project Medicine Drop initiative. The initiative allows consumers to dispose of unused or expired medications anonymously, seven days a week, 365 days a year, at drop boxes resembling large mailboxes. The boxes, which are prominently marked and affixed to a floor or wall in a secure area, are located within the police headquarters of more than 40 participating departments in all 21 counties statewide, including the Union County Police Department, 300 North Ave. East in Westfield, and the Elizabeth Police Department, 1 Police Plaza in Elizabeth. A new drop box also is expected to be introduced shortly to cover the northern portions of Union County. The participating police agencies maintain possession of the deposited drugs and dispose of them according to their normal procedures for the custody and destruction of controlled dangerous substances. They report the quantity of discarded drugs to the Division of Consumer Affairs on a quarterly basis; consumers dropped off approximately 1,600 pounds of unused medications at the boxes during the first quarter of 2013, including several hundred at the Union County Police Department drop box alone. Every day, an average of 40 Americans die from an overdose caused by prescription painkiller abuse, according to statistics compiled by the federal Centers for Disease Control – such overdoses now kill more people in the U.S. annually than heroin and cocaine overdoses combined. The prosecutor’s office is being joined by the aforementioned agencies, the Union County Medical Society, and the Medical Society of New Jersey in working to raise awareness about the matter. Physicians, both here and statewide, have agreed to notify their patients of local drop box locations and are being encouraged to talk to their patients about proper disposal of medication and the dangers of improper disposal. On Saturday, Oct. 26, 2013, Make A Difference Day, several local medical societies throughout New Jersey also will promote Project Medicine Drop in their counties. For safety reasons, only solid medications such as pills, patches, inhalers and similar objects will be accepted at the Project Medicine Drop boxes. Liquids, medical waste, or syringes will not be accepted, and consumers wishing to discard such materials should ask their doctors or pharmacists to find the safest and best ways to dispose of them. It also should be noted that consumers only may dispose of legal prescription or over-the-counter medications; anyone wishing to dispose of any illicit drug should follow the normal procedure of reporting it to police. The Project Medicine Drop initiative builds on the success of the U.S. Drug Enforcement Administration’s National Take Back Initiative and the American Medicine Chest Challenge, which is sponsored in New Jersey by the DEA, Partnership for a Drug-Free New Jersey, and the Sheriffs’ Association of New Jersey. Both programs provide single-day opportunities to drop off unused medications at pre-identified, secure locations. 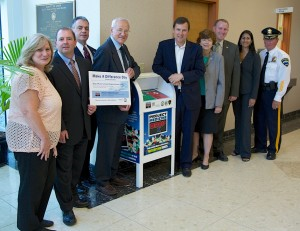 For more information about Project Medicine Drop, go online towww.njconsumeraffairs.gov/meddrop.